When I was gathering photos from Pittsburgh for Saturday’s post, I was going to include one of the Duquesne Incline. While searching for it, I realized that, unlike so many places that I visited before joining Thursday Doors, I had actually taken pictures of the doors at the Pittsburgh inclines. ‘Inclines’ is barely plural today, but at one time, there were 15 incline railways carrying workers up and down Pittsburgh’s most famous hills. The two remaining railways are both on Mt Washington, the large hill that separates Pittsburgh from the southwest suburbs where I grew up. 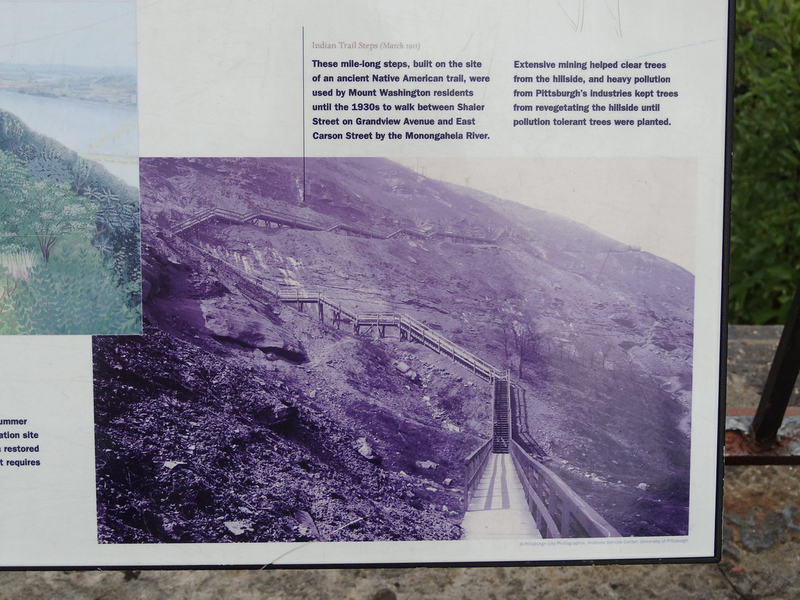 Tunnels bring people through Mt Washington, and bridges carry them over the Monongahela River, but the inclines were the best, and still are the most interesting way to get up and down. Prior to the inclines, workers would actually climb up and down about a mile of steps. Mile-long stairway connecting Mt. Washington to the mills along the river. The Duquesne Incline is my favorite. Any time people would visit from out of town, my father would take them there. Any time we have visited, I’ve offered to take my family for a ride. Faith eagerly joined me in the car. The Mrs. prefers to wait at the top. Although they are sometimes referred to as railways, they operate more like an elevator than a train. The cars do ride on rails, but they are not under power. They are pulled up and let down via cables, with each car counterbalancing the other. The Duquesne Incline opened in 1877, carrying passengers up and down “Coal Hill” as it was known. Mining was a significant industry, as the nearby steel mills had quite an appetite for coal and coke, a processed form of coal. At the time the Duquesne Incline opened, there were four inclines operating on what would become known as Mt. Washington. The Duquesne Inclined Plane Company ran the incline from 1877 until 1962. Since 1964, it has been owned by the Port Authority of Allegheny County and operated by the Society for the Preservation of the Duquesne Heights Incline. The incline rises 400 feet as it’s pulled along 794 feet of track. Those of you who enjoy word problems can work that out, but for the rest of you, the track grade is about 58% at 30 degrees. The cars move 18 people (each) at a whopping 6 miles per hour. Inside the powerhouse of the Duquesne Incline, a diagram illustrates the complex cable routing. 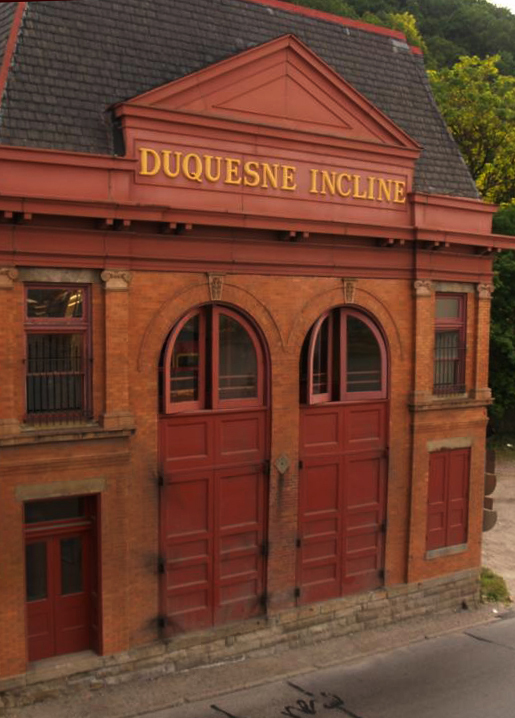 You can tour the powerhouse of the Duquesne Incline. The gears have wooden teeth that can be individually replaced as they wear. The very cool thing about the Duquesne Incline is the complicated way the hoisting cables work. The builders were unable to secure the land across the street, so the power house sits perpendicular to the track. The cables wind through a series of pulleys and sheaves. The whole operation is powered by a 75 horsepower motor. For my editor and those of you worried about being dragged up almost 800 feet on a 140 year old contraption, there is a safety cable attached to each car. A little under a mile south of the Duquesne Incline, is the Monongahela Incline. Built in 1870, this incline is located near the Smithfield Street Bridge, one of the oldest bridges across the Monongahela River. The Monongahela Incline is 635 feet long, and rises 367.4 feet. Now let’s not see the same hands. Less height, but much less distance… Come on… OK, the grade is over 70% at an angle of about 35 degrees. Yes, that’s kind of steep. The interesting feature of the Monongahela incline is its three-level cars. As you prepare to board, you have to position yourself on one of three staircase landings, and you exit onto a similar arrangement. Like the Duquesne Incline, there is no power and there are no operators in the cars. The operator runs the cars from the upper station, where the power and cable management apparatus are housed. Unlike its neighbor to the north, the Monongahela Incline’s power house is a straight-shot down the track. The inclines are major tourist attractions today, and some of the best photos of Pittsburgh can be taken from Mt. Washington. I love riding the inclines, and I love seeing little children pile up next to the window to watch the track as we descend. Monongahela Incline on the move. Faith took this photo looking up the tracks from the lower station. The view of Pittsburgh from the top of Mt. Washington is stunning. That’s the entrance to the Duquesne Incline. Once the car arrives, you enter and exit through that door. This is the entrance to the Monongahela Incline. You have to pick which car you want to ride. Inside the car of the Duquesne Incline. Nothing much has changed since 1877. This post is part of Norm Frampton’s Thursday Doors series. If you want to join the fun, or see lots more doors, pop on over to Norm’s place and look for the blue button. Note: one of the children in the window is Faith. If you want to see her pictures from this trip, head to her Flickr site. Thanks Judy. If you ever visit Pittsburgh, I would highly recommend a trip up the Duquesne Incline. The view from the top is worth it. In the early 70’s I covered the Northeast Region for GAF when they entered the microfilm industry and Pittsburgh was always one of my favorite cities to visit so we could take customer up or down the mountain before or after dinner at LeMont Restaurant. Incredible views from their dining room. Good memories, will have to go back one of these days. One of my good friends in high school might have been your waiter, Bob. He worked at LeMont during that time. The views from Mt. Washington are very special. I took a look at that staircase going up the mountain and my heart did a little lurch. Wow. I wouldn’t want to do that trip every day!! I had never heard the term ‘incline’ used before. I immediately thought of the funicular in Quebec City. You added to my education today because now I know they’re the same thing. I really like the photo looking down on the little red car. Great perspective. Thanks Joanne. You added to my education today as well. I just popped over and looked up ‘funicular’ :) I don’t think the car could go off-cable and smash into the bottom. The worst thing would be if you had to exit the car and hike up the little slat stairway. Anyway, you can wait at the station with my wife, she’s good company. I am glad you enjoyed this, Ruth. It is a fun ride and the view is amazing. Please do. And, of course, share the photos. Ah, now here we a unique entry in this series. Good choice! Big red doors, and in an old brick building? Check. Then, as a bonus, we get the incline. I’d enjoy this little ride. Cool post, Dan. Thanks Paul. I’m glad you enjoyed it. I was surprised when I realized that so many of the photos included doors. I have to schedule a day of door-picture-taking the next time we visit. That’s a very interesting bit of history, Dan. Thanks for sharing it. I’m still analyzing my reaction to the Duquesne building. While I don’t exactly find it attractive, and not inviting… I’m oddly intrigued by it. I want to go inside those doors. I don’t know why. Major,conference room-filled budget meetings at main campus this week. And when the meetings are not on… the air conditioning in my office building has been out all week. You’d think they’d make open-able windows… Great doors post. Hugs. Major meetings here too :( Thanks for carving out a few minutes to visit, look and comment, Teagan. I always appreciate your support. Pittsburgh is certainly a city of hills, Dan, one of which always seems to be between you and where you’re headed. :-) We’ve seen the inclines, but never gone up. Looks like it would be fun. The doors are great and it made me smile to see that we both chose, independently, some different doors this week. Happy Thursday! Pittsburgh hills are a challenge, but I grew up loving to ride my bike up and down, all over the place. It’s listed today as one of the more bike-friendly cities. I have never heard of or taken a ride on an Incline. But I would…I’m not scared! The view is amazing. Thanks for another little piece of Pittsburgh history. I’m glad that they kept the inclines going for the tourists, and small children, and Faith. Nice photos and door post, Dan! As long as they don’t go around and around like an amusement ride or up and down like a roller coaster, I would be fine. Not to worry. Up and down, slow and Steady. I could not do the incline. OK, I could but I would have to shut my eyes the entire time. Thus defeating the whole purpose of taking the ride! Interesting post, though. You can wait in the station with Joanne and my wife, Lois. The lower station of the Duquesne incline is actually a small museum. Thanks for stopping by. Thanks Val. It’s always fun. Thanks for this Dan. My wife and I loved it. My memories of Mt Washington are dear. I always loved to hear folks try to pronounce Duquesne. You know Duke ness etc. When the brewery was still operating, they used to have a commercial with this little bye who would say “I’ll have a duke quessne” – I’m glad you guys enjoyed this. If you follow the link to Faith’s photos, she has a lot of photos in that set from all over the city. That trip was her introduction to Pittsburgh. You say incline, we say funicular but either way – cool idea for a post Dan! I have eyed them on my two visits to Pittsburgh but alas, never had the time to take a ride. Hopefully next time. Thanks Norm. I learned a new word today. They are definitely worth a ride if you get back there. I always like your doors, but it’s even better that you include the history with it. Great job, Dan! What a wonderful looking building, Dan! It’s interesting how the architecture of the time creates a strong and imposing, yet warm and inviting, allure. Today’s modern architecture may inspire oos and awws too, but I find it much too cold and clinical. Too much smooth metal and glass, not enough brick, colour and texture. And it’s nice to see that they’ve retained the antiqueness on the inside of the car. It has so much charm and character. Looking at that photo, I can’t help but wonder if you stayed on long enough, would it somehow eventually stop at Willoughby…? Ha! It does have the look of the old rail car in that episode. Let’s hope I’m not getting off there. I imagine that the lamp was originally gas, but I’m glad they electrified it and kept the look. I love these old buildings. There is so much passion visible in the result. I think today’s contractors are beginning to think more about appearance but there’s still too much steel and glass. Thanks Wendy. Thank you for that wealth of information in addition to the photos. We are going to be in Pittsburgh briefly this summer and the inclines are at the top of our To Do list. The only decision is which one to take. Which would you recommend for first timers? I prefer the view from the Duquense Incline, especially at night. You can also tour the powerhouse on that incline (I’m not sure if you can on the Mon). The Monongahela is very close to Station Square at the bottom end, so there’s more to do. You can park at Station Sq, ride the incline, take a tour on one of the Gateway Clipper Fleet boats (I used to work on them). If you’re going to a ball game, you can actually take the Clipper to PNC Park. He-Man never told me about these! I would love to ride them both. Especially the one to Mt. Washington for the view in the evening. I love the red cars of Duquesne Incline. Great history lesson and post today Dan! Thanks Deborah. You would love the view. When I took Faith up there the first time, I was standing a long time while she got the photos she wanted. The link to her Flickr site is to the photos from that entire trip, but a bunch are from up there. Very cool, Dan. :) Thanks for sharing this. If I remember right, there’s something like this in Niagara Falls (Canadian side). Thanks Linda. I’ve been to Niagara Falls a few times, but I don’t remember seeing that. If I go again, I’ll look. It would be fun to get down below. Ah, it’s amazing. The power of all that water coming down is awe-inspiring. And the Maid of the Mist is an incredible ride. Oh Ellen, I’m sure I’ll get back up there. Thanks for the link. Thanks! Now I’m trying to figure out how I missed the incline at Niagara Falls – Hmmm. I’ve been on others. I even got my wife to go on one, heading down to the powerhouse of Coulee Dam. She didn’t like it much, but she went. I used to love stuff like that. Now I just can’t deal. I’ve always been to the Canadian side. I missed it. Dammit. That reminds me of the funicular in Budapest, it was the first time I was ever in one. For someone not to happy with heights I loved it. That red carriage is beautiful and what amazing views from the top. Thank you. I’ve been pleasantly surprised to see how many others have seen these. Loved the post, enjoyed reading about its past. I have seen this thing in many travel videos but don’t have such options here in India. Many places now have cable cars, but I don’t use it. I bet on my legs than anything else. I’m starting to feel that Pittsburgh is the best city where I love to settle down, if I was there. Although, Boston was my first choice but I changed it to Denver later on, now I think Pittsburgh should be fine. Thank you Sharukh. I’m not on the tourism board for Pittsburgh, but it is a pretty cool place to live. It’s been rated as the Most Livable City a couple of times. Boston is a great city too. Now, I learned something fascinating about Inclines and this being in Pittsburgh makes it extra special! Thanks Robin. When I get back there, I’ll try to find that mural. Thank you. I enjoy digging up (slight pun intended) the history. There are very few remnants of the industrial past still operating, so I’m glad these are being preserved. Ever thought of becoming (some kind of) historian? No, not really. Everything I find has already been written about, usually in greater detail, by others. I don’t know if I have the ability to really add to the body of knowledge. But thanks for suggesting that I could. Thanks for taking time out of you (overly) busy schedule to stop by, Amy. If you ever make it down to Pgh, these are worth a ride, and you would go ape over the photo opportunities from the top. There’s a gondola at Vail, Colorado that will take the passengers to the top of their highest skiing point. It’s used both summer and winter. It doesn’t have the old-world charm that the one you show here does though. Thanks Kate! I’ve ridden the cable cars during a couple of visits and I’ve always enjoyed them. I have been to Pittsburgh many times, and have never ridden either of the inclines! It’s really my own fault for not taking the time to do it! Maybe next time? The view from the top is worth the ride. Yes – I definitely need to make the time next time! Ah…I remember my boyfriend taking me on the Incline when I was a student at Duquesne in the 1970s. Thanks for the memory. Love this! There’s an incline railway not too terribly far from here at French Lick. Mom and I rode it, back when she still got out and about. :) Thanks for the happy memory! I was in Pittsburgh for business a long time ago and rode one of these during the evening. The city was gorgeous as the lights went on and gleamed over the river. Thanks for the history! I’m glad you enjoyed this. I’m also glad that you’ve had the experience. How cool is that!!! Love it…great post….pictures and descriptions were perfect…felt like I was there. I have seen pictures of the Pittsburgh inclines, but having never been there, so appreciated your blog on them. Thanks Kirt. I’m so glad people are enjoying this post.These are one of my favorite things the city has. If I ever go to Pittsburgh, I’ll be sure to check out that Incline attraction. I’ve never heard of it and now my interest is piqued. I don’t do “heavy duty” rides, so I hope this one isn’t scary. Oh, first time I’m hearing on this Incline ride. Thanks for adding to my education! Have a great Father’s day weekend with Faith and Mrs. Antion. Thanks Elaine. It’s a very slow ride. They are still designed just to move people up and down, not to scare them.